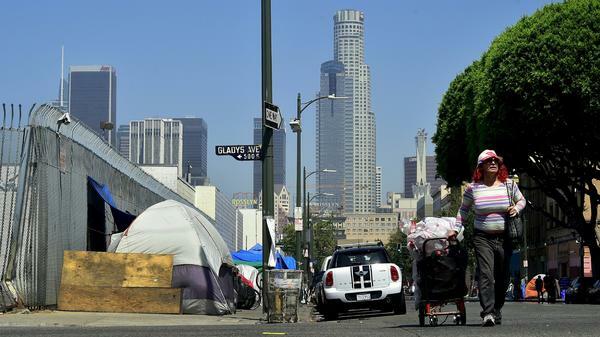 The increase is almost entirely due to a surge in homelessness in Los Angeles and other cities facing severe shortages of affordable housing, say HUD officials. Many of the cities are on the West Coast, including Seattle, San Diego and Sacramento, Calif. Overall, the nation's homeless numbers are 13 percent lower than they were in 2010 and some communities have all but eliminated homelessness among veterans, emphasized HUD Secretary Ben Carson. "Where we're not making great progress are in places like Los Angeles and New York City. These happen to be places where the rents are going up much faster than the incomes," said Carson in an interview with NPR. In fact, Los Angeles reported a nearly 26 percent rise in homelessness this year over 2016. Most of the increase was among individuals living outside on the street. The number of homeless veterans was also up 1.5 percent nationally, despite major efforts by the government and nonprofit groups to house veterans. Again, officials say that rise is due to the unusually large surge in homeless veterans in Los Angeles. Veterans' homelessness in the rest of the nation, excluding the city and county of Los Angeles, dropped by 3.2 percent. Nan Roman, president and CEO of the National Alliance to End Homelessness, was surprised the overall numbers weren't better. "Just because I think there's been a continuing investment in veterans, and an improvement in approaches," she says. "We might expect to have seen a continuing downward trend. And we're not." Roman says it's increasingly difficult to find available units in some areas of the country to house the homeless. And she worries the problem could get worse. Housing advocates note that the Trump administration has proposed cutting low-income housing subsidies, which many people rely on to stay housed. They also believe the tax bill working its way through Congress could discourage investment in new affordable housing construction by reducing tax credits used by developers. Carson insists the administration is committed to helping homeless individuals, but he says that the federal government needs to work more with nonprofits, faith-based communities, state and local governments and the private sector to address the problem. "We just need to move a little bit away from the concept that only the government can solve this problem by throwing more money at it," he says. In fact, much of the progress that's been made in recent years reducing homelessness has been the result of joint efforts between nonprofits, the private sector and government. There are also some positive trends. While veterans' homelessness is up, tens of thousands of homeless veterans have been housed in recent years. This year's count of 40,056 is 46 percent lower than it was in 2010. Family homelessness was also down 5.4 percent from last year and 27 percent lower than it was in 2010. Still, there were 58,000 families with children living outside or in shelters earlier this year. The number of unaccompanied homeless youth and children was close to 41,000; more than half were unsheltered. The number of people experiencing chronic or long-term homelessness was also up 12 percent from the year before.